Even before Dana was born I knew I would put a ridiculous amount of pressure on myself to get her photos on the wall quickly. Yes, I said I wouldn’t let differences in the number of photos get to me, and for instagram or facebook it generally doesn’t. The photo collections on the walls, however, are ones we see every day. I wanted parity. Besides, some of the ideas I had for photo collections had very real time constraints. Back in march I told Domingo I had just one photo left I needed to update to include Dana. The family portrait over the fireplace? He asked. Anyway, the “one photo” I was thinking of back then was for our entrance way console photo collection. I have one of Alexis’s newborn photos by the tree, as well as Nicole in the window, each in a similar silver frame. What both photos have in common? Both are naked baby photos, both inside, neither against a backdrop, and in both photos my kids aren’t looking at the camera. Coming up with a similar photo concept for Dana was a tall order. I especially struggle with non backdrop backgrounds in formal photography, especially especially in doors. Since it had to be a baby photo, the clock was ticking. This afternoon while Dana was napping I looked up from my computer and noticed it was finally overcast outside. That meant nice outdoor photos without harsh sun were a possibility. While these types of days become more common in the fall, they’re often accompanies by cooler weather which would make naked photos impracticable. Here we were, end of August and I hadn’t taken a single nice outdoor photo of Dana yet. By the time she had woken up from her nap and finished her lunch the sun was drifting in an out of the clouds. I started to assemble my camera, thought better of it, and changed my mind again. True, the lighting wasn’t great, but Dana seemed to be in an amenable mood. What’s the harm in trying? I’m so happy I did. The sun stayed mostly at bay, and we ended up with some cute photos. Dana squealed with delight outside. She has never seen this side of the house before, and loved it. Best of all, I now have a possible photo for my collection. Maybe I’ll come up with a better photo idea, one inside the house that better matches the photos of Nicole and Alexis. If not, at least I have this one. This summer I replaced the picture of the mantel with a new family photo. Between my home screen and lock screen the kids each appear the same number of times on my phone. It’ll tide me over until I get a good portrait oriented photo of all three girls that fits the phones dimensions. Now that The family is complete, and I’ve added Dana to my walls, many of these framed photos are photos I hope to never take down. The pictures are perfect. Now I want the frames to be perfect to match. My chief complaint? Reflections in the glass. Curse you California sun. Glaze is the industry term for the clear substance (glass or acrylic) that sits between the artwork and the outside world. The first thing I looked into was museum glass. I had done some customs framing at Michael’s and the Museam Glass did a good job at cutting down the reflections. Chief issues was that it’s heavy (not great in Earthquake country), an super expensive. The bulk + weight makes shipping impractical. I had a hard time finding places that would sell it to non custom framers or in small quantities. The places that would ship to me charged about $50 for a single 8×10. I next came across water white anti reflective glass. Water white refers to the fact that it shouldn’t add any tint to the photos. Since I was framing artwork (the butter footprints) on white paper, that was very important to me. I found it did an excellent job of cutting down ambient light to the point were I could easily see the texture of the photos from a few feet away. Direct sunlight was a different story. It wasn’t as good with direct light as the Museum glass, and not as good as I would have liked, but better than the cheap glass that comes in the cheap frames. I went from not being able to see any of the photograph, to not seeing most of the photograph. An 8×10 ran about $20. The third option was to skip glazing all together. It’s not a perfect solution as the photo paper itself is slightly reflective, but if you’re wall is going to be bathed in sunlight half the day, it may be the only thing that works. One drawback is your artwork isn’t protected from the elements. That’s less of an issue when your artwork can be replaced by your home printer, but something to keep in mind if it can’t. 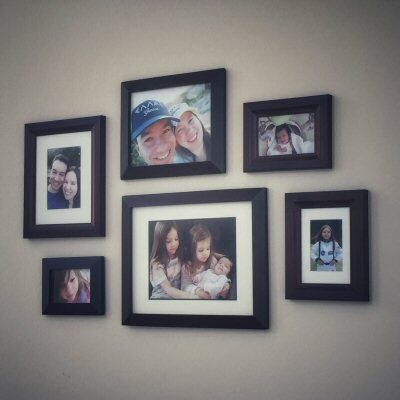 To go this third route you need to potentially consider how hard it is to replace a cheap picture frame. I should detour and mention that most of my frames are cheap, costing anywhere from a couple bucks for the small sizes to $20 to the matted large frames. I do have a couple expensive frames (mostly gifts). The expensive frames have sawtooth hangers (a long piece of metal with serrated edge) for hanging on the wall and point tabs for keeping the frame and backing together. I worry those point tabs will eventually snap off with repeated picture changes, so I’d rather not change out those prints any more than I have to. I went the no glazing route for my 3 favorite photos. They’re hung low, easy to reach, and the sawtooth hooks make them easy to take down and put back up. Should the originals fade over time without protection they will be easy enough to replace. For the kids footprints I opted for protective glazing. Anything that was too large to be printed at home, or the metal tab points made it difficult to replace also got glazing. The final consideration was sizing. Most frames the glazing matches the advertised picture size. For frames that come with mats the mats typically corresponded with a common photo size. For example The matted 5×7 picture frame had a mat that was 11×14, and the glazing matched that size. I did have two frames (4×6 and 5×7) where that was not the case. The first was a quarter inch smaller in each direction, the second was a hair thinner but I managed to get the glass in with a bit of force. I only needed one custom frame size for that 4×6. Now I just need to figure out what to do with the old glass. One sign that it’s time to update the photos on the wall? When the kids can no longer recognize themselves in the. A disagreement started the other day about who was who in one of the couple of the framed photos. Both Alexis and Nicole where convinced the photo of a 18 month old Nicole was them. And that three month old photo of Alexis? Alexis was sure it was baby Dana and nothing could convince her otherwise. I had wanted to get photos of Dana up on my wall for a while. All I needed was the motivation. Cue said motivation. The top photo of Domingo and I is from our honeymoon, I suspect it will stay there forever. The photo of the three girls together will likely as well. Those are such special moments. I’m considering keeping the Nicole as an astronaut as the quintessential Nicole photo. I’ve been meaning to replace the photo on the left of Domingo and I with a family photo, but it’s still proving challenging. Alexis and Dana photos will likely be replaced some day with their quintessential versions at some point. Alexis is so adorable. She noticed the new photos right away and actually thanked me for putting them up! She is amazingly consistent about always using her ‘please’, ‘thank you’s and ‘your welcome’s. This weekend I also put up the butterfly footprints on our wall. I had a bit of a dilemma with these. I had previously done Nicole & Alexis’ prints back when we moved into the house. At the time Dana was a daydream. I loved the frames I was using, and knew they may no longer be manufactured should I want to add another set of prints a few years down the line. So I purchased an extra frame in case the daydream came to be. I actually purchased 4 extra frames to cover all possible scenarios. A 4×6 frame in case I had the prints of a newborn child to add. Two more 8x10s in case I wanted to take all three kids’ prints from the same time period, but also wanted to keep the existing prints for my memory chest. And finally, a 10×14 as I couldn’t be sure how big a possible five year old’s feet would be and thought there was a chance I might need a bigger size. I over think everything. I meant to also purchase a 5×7 increase the 4×6 wasn’t big enough, but there was none in stock. Wouldn’t you know the one frame I needed for Dana was that 5×7, which never came back in stock? I thought Dana might looked tact on if I used a different frame. But I also liked the existing frames, and couldn’t find a close enough match. The solution? More butterflies! We now have two sets, when we moved in to our forever home, and when our family became complete. It might be a little too much for some people, but I like it. I did consider taking Nicole’s newborn foot print and faking a third set so I have one from when each girl was a baby, but six butterflies is probably a little too much, even for me. Next up, a collage three years in the making. I just need to find the strength to move some furniture first. I have been slow to put up Halloween decorations this year. At first I blamed the wild life, as it was ripping up our lawn and wreaking havoc in our flower beds. Why risk the Halloween decorations being knocked over and damaged, I told myself. But as the weeks progressed I realized I’m just not that happy with our current set of Halloween decorations. Most of our outdoor decorations just don’t work for our current home. There’s the “Welcome” orange street lamp that worked well on our town home front stoop, what with the non-existent front yard. At our home, it all but disappears from view on our porch. After nine years years the finish is coming off, it’s starting to rust, and it’s barely up right. There are the skulls and scattered bones that look cool, but you can only see them up close. Lastly there’s the posable spider which ended up being a huge mistake as it sheds like crazy and is hard to find a good spot for it. We’ve been in our home now for two years, and plan to stay throughout the kids’ high school years. I thought it was time to do away with the decorations that just aren’t cutting it. Alexis has been a little fearful of some of the more animated and scary decorations, so I wanted something friendly and approachable while still being appropriate for the season. My first concern was to light the walkway. 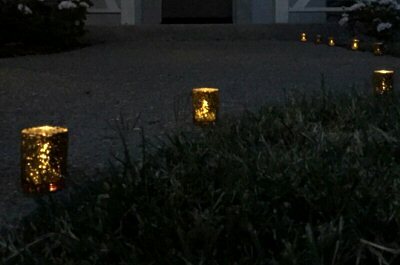 I wanted to use luminaries, but rather than use traditional paper bag luminaries with LED tealights, I decided to go with candles. I found these. Ironically the reviewers chief complaint (that they’re too orange) made them ideal for me. It ended up being a bit pricey for luminaries ($24 for the candle holders, $10 for the tea lights), but they should last for years. In the corner on the other side of our walk way I plan to put a non-animatronic stone statue and a lit pumpkin. I envision something made out of grapevine with twinkle lights. This would be perfect, if it was weather resistent. Alas, a carved pumpkin doesn’t work too well here. Last year our jack-o-lantern liquefied in 36 hours thanks to the intense UV rays. I have my eye on a statue that will work, and am just waiting for the right sale. (I’ve waited this long, might as well wait a few more days.) The grapevine pumpkin is proving to be a bit more difficult. It seems to be a popular in door only decoration. Still, I’m nothing if not persistent. And frugal. Most of the time. I always assumed the girls would prefer to be in their own room, but Nicole recently confided in me that she’d prefer to have someone sleep in her room with her. (She requested Mommy, and then pointed out that Daddy gets to share a room with Mommy when I said Mommy had to sleep in her own room.) I realize I’ve been projecting late childhood and early teenage sensibilities onto the girls. It’s totally reasonable that a four year old and two year old would prefer company to privacy. The timing seemed ideal. Domingo has been on travel a lot lately, which gives us a built in excuse should our shared room experience go awry and I need to abort. I could tell the kids Alexis was sleeping over in Nicole’s room as a special treat while Daddy was away. If things worked out, we would keep the arrangement permanently. If not, and the kids kept each other awake, well they were expecting to go back to their own rooms in a few days anyway. Alexis had moved to a toddler bed at the end of March, so all I needed to do was move the crib mattress into Nicole’s room. To celebrate, I decided to redo the room to accommodate both girls. My favorite part? 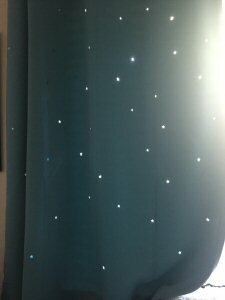 The die cut blackout curtains (pictured above). They let in just enough light to appear like twinkling stars and are so super soft. Usually I don’t trust my decorating skills and shoot for neutral, safe, colors. This time I went with turquoise and I love the splash of color. Ignore the color in the photo, that has to do with shutter speed and the abundance of sunlight sneaking in through the side of the open curtain. The true color is much closer to the one shown on Amazon. The girls’ favorite part? The princess canvas wall art. Cinderella is currently Alexis’ favorite, and Belle is Nicole’s so it works out nicely. Personally I could have done without the glitter and rhinestones, but I like the subtle design in the negative space, and really it’s their room so it’s okay that it’s not quite my style. Bonus it was 10% off. In the coming days we’ll purchase a twin mattress for Alexis. We’re thinking about bunk beds for the girls when we’re sure we can trust Alexis to stay stationary in bed. Their room is large, but an awkward shape. I’m not sure two twin beds will fit comfortable otherwise. We lost another ceiling fan. That’s the third one to die in under two years. I suspect it’s another issue with the ceiling fan controller. That’s the issue claimed the previous two fans. So we’ll be making our third call to an electrician in less than a year. le sigh. Could be worse I suppose. There’s a part of me that wonders if the problems we’ve been having may be a wattage issue. We noticed our outside bulbs had a ridiculously short half life until we went with a lower wattage. Could lower wattages help the ceiling fans last longer? Either way, it seems like a good excuse to finally make that switch to LEDs that we’ve been considering. Of course I first thought of our experience with Hue light strips. I recently learned that Hue is making a line of white bulbs that let you choose the warmth/cool color level of the light which is appealing. You can set the light color temperature to what’s appropriate for time of day or activity, like photography. On the other hand I spent a lot of money on those light strips that are still in the closet, yet to find a good place in our new home. Then there’s the bulb size issue. Hue is coming out with a candelabra/candle but it won’t be available until later this year. Given all the grief I’ve gone with other new to market products, I have lost my desire to be an early adopter to anything. I decided to pass on Hue and it’s customobility… for now. Instead I went with a lower wattage yellow light LEDs that bathes the room in an inviting glow. It’s not perfect for photography, but as long as the lighting temperature is consistent, I simple white balance adjustment will be fine. I opted to go with replacement bulbs in the recesses fixtures, rather than new recesses fixtures to give me the flexibility to change my mind on the color temperature later. I started with the first floor, candelabra ($2-9 per depending on the shape) for the living room and dinning room and recessed lighting bulbs ($4.28 per bulb) for the kitchen. Hue is more typically $30 a bulb, but can range from $25-50 depending on a number of factors. I paid a lot more than that when the technology was brand new. As for shopping, there wasn’t much of a selection in brick and mortar stores for the candelabra base. I had one option with each globe shape and couldn’t choose the color warmth. Online offered a way better selection, but prices varied wildly. It can also be really hard to gage whether it’s the right size bulb. It helped that the only non-medium (the standard household bulb base) base I needed was that candelabra. To keep the price down, I bought in bulk and didn’t worry too much whether I was getting a “low quality” LED. From my research, quality in the LED world corresponds to longevity of the bulb. Even cheap LED are supposed to have something like 10 times the life of traditional bulbs. Good quality LEDs might have twice that life span. Either way, it’ll be a long time before I need to replace any of them. Given that, I set some extremely low price watches on CamelCamelCamel for replacement bulbs. That way I can be thrifty, and prepared at the same time. Cheaper LED bulbs that last longer and require less energy than traditional bulbs. It’s the hat trick of saving! One last tip which may sound kind of nutty: I separated my bulbs based on color temperature. Warm light bulbs are on one shelf, cool light bulbs on another. That way I can easily replace a burnt out bulb for another like bulb. I cannot stand mixed warmth lighting. 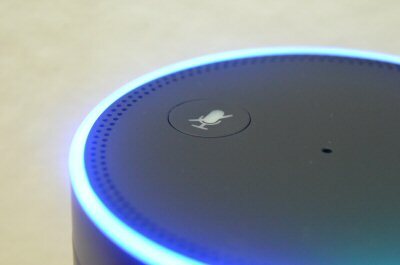 Technically it’s “Hello, Echo!” We had to change the wake word since ‘Alexa’ and ‘Alexis’ are too phonetically similar. Last Amazon Prime day I purchased the Echo. It’s sat in it’s box until now. I clearly have not learned my lesson. At least this time I didn’t buy two. I admit I wasn’t sure how much use case we’d get out of Echo. With our push for a smart home, it seemed like a tool that would one day control everything. At the time I didn’t realize that it could talk to our new irrigation system at the time of purchase. I did think it would be nice to ask Echo about the weather while busy trying to dress the kids in the morning. It’s not often I have a hand free to crack open my laptop or check my mobile device. It would also be nice to have a way of playing Christmas music. We gave up the only stereo we had when we downsized, and laptop speakers don’t work as well. When Amazon had its sale we figured we’d grow into Echo. Now that it’s set up I can say it’s worth it now. Nicole is constantly asking it to play songs, only she doesn’t know their titles so her request of “please play Elsa” falls on confused digital ears. Domingo has been referring to Echo as “the robot” and now Nicole is eager to build a robot of her own. That makes this engineering Mama extremely happy to hear. Alexis, for her part, runs around chanting “Ek-oh! Ek-oh!” When Alexis woke up from her nap this afternoon I asked her if she wanted to play with Nicole. She only blinked at my groggily. I asked if she wanted to play with Echo? “Ek-oh!” She puts too much of a pause between the syllables for Echo to understand her, but I’m sure she’ll get the hang of it in no time. It took the girls less than 20 minutes to figure out they could add crackers to Mommy’s shopping list. That may be off putting to some. Had it not been possible to disable voice purchasing I would have been annoyed too. Since I can, and don’t need to worry about spurious photos, I’m eager to see my kids learn how to interact with all kinds of technology. Maybe in a few years I’ll be able to hire Nicole as an App developer. She’s already inspired enough to build a robot. So that’s speakers, future proofing for our smart home, a toy for the kids and fostering our love of robotics all for just $141 (with tax). Well, and an additional $7.74 so Nicole could listen to the full songs from Frozen, and not just the 30 second free samples. I’ve been thinking about updating our dress-up corner ever since the girls had a vintage style photo session at their school at the beginning of the year. (Vintage preschool photos are all the range around here, two of the three preschools we’ve gone to have done them.) I loved the idea of hanging one of their photos in the dress-up corner, which had turned into a pile of clothes since the coat hanger really isn’t enough storage space any more. For the makeshift dresser I used a cheap, two tiered bookshelf. Cheap was an important criteria as I knew I’d be destroying it in the process of converting it into a dresser and I hate to destroy anything I spend money on. I lowered the shelves and converted them into a two tiered shoe rack, attached hooks to the side of the bookshelf for accessories and strung a tension rode strung across to hold the clothes. Easy Peasy. I had intended to use the pre-drilled holes the bookshelf came with, but they were two high for the shoe rack. The second shelf (obscured partially by the clothes) was at the lowest set of pre-drilled holes. Even as it is, that shelf is a bit high for four year old clothes, really. Many of the capes especially hang over the edge of that shelf. To create the holders for the second, lower, shelf I screwed four wood screws into the wood, leaving them to protrude about a quarter inch for the shelf to rest on. I picked screws with heads about the same width as the pegs, so the shelf grooves would fit over them. I didn’t bother doing a very thorough job of the placement of the shelf. I lined it up where I wanted it to go, and used one of Nick’s crayons to mark the shelf grooves before screwing in the screws. To hold the superhero masks (because every child needs a super hero mask or 10!) I used wall hooks. The screws that came with the wall hooks were far too long for thin bookshelf wood, so I just glued ’em on (E6100, my trusty standby). I used masking tape to help hold the hooks steady while the glue was drying. Not the most elegant solution, but it works well enough. The picture that started it all. Aside: If you want to take a photo of a picture frame, but your reflection keeps getting in the way, get a longer lens and stand further back. From a distance you can stand slightly to the side of the frame rather than directly in front and have minimal distortions. Painting the playroom is still on my todo list. It suddenly dawned on me that in a few weeks we’ll have been in our new home a full year. After the electrician ended up not being nearly as expensive as I feared, we decided to hire him back and fix a few more issues for us. Most critical was the fire alarms. Shortly after moving in the fire alarm above the stair case went off in the middle of the night, thoroughly freaking out Nicole. A fresh pair of batteries and it would still occasionally chirp, reigniting Nicole’s fears each time. The alarm was probably past it’s prime and needed to be replaced. The alarms in our home are interconnected, so the simplest solution was to purchase the same brand as the faulty alarm and just switch out the alarm leaving the harness in tact. But I couldn’t find a replacement. It turns out the manufacturer of the fault alarm had gone out of business ten years ago. (The National Fire Protection Association recommends replacing fire alarms every ten years.) All five of the fire alarms we had in our home from that manufacturer were likely past their prime. Not only would the harnesses need to be replaced, but it would need to be re-wired. State law requires a fire alarm in each bedroom and in the nearby vicinity outside the bedrooms. With the layout of our home, that means four fire alarms (including the faulty one) within 6 feet of each other. Two of which looked brand new, the others needed to be replaced but still appeared to be functional. I didn’t see much harm in leaving this one disconnected this past year. The problem arises should we ever decide to sell the house. Besides, those other old fire alarms felt like a ticking time bomb. They were functional now, but how long until age caused them to go off randomly in the middle of the night? The second issue we had was the ceiling fans. The ceiling fan in the office was original to the house, and the light could no longer be turned on. It was a minor annoyance since we could use a lamp. The previous occupant of Alexis’ room had held a broom up to the fan, damaging one of the blades. Although it was still fully functional, the damaged fans was one of the eye sores I noted when I first toured the house. Fixing it would drastically increase the visual appeal of the room. Much more my style, and – bonus! – it works! The electrician has been recommending we switch out our lighting fixtures to more energy efficient ones. It’s an appealing idea. The LEDs require less energy and create a whiter light better for photography. I’d love to get those eyelights I’ve been wanting, and a more modern chandelier in the dinning room would be nice. That’s the problem with home improvements. There’s always something else that can be improved upon. For now I’m moving on from the electrical improvements. Alexis’ room is still purple, except for one two foot splash of cream from when I thought I’d try out a new color. From July. I should probably actually, you know, paint.